If there’s one dish that I love, it’s Thai Kapow Beef with basil and chili sauce. This spicy dish is my barometer for good food at any Thai restaurant I visit. Sadly, I’ve drastically reduced my rice intake and thus have not been eating Thai food as often. Quite frankly, there’s not much that feels healthy when I eat Thai food at a restaurant. 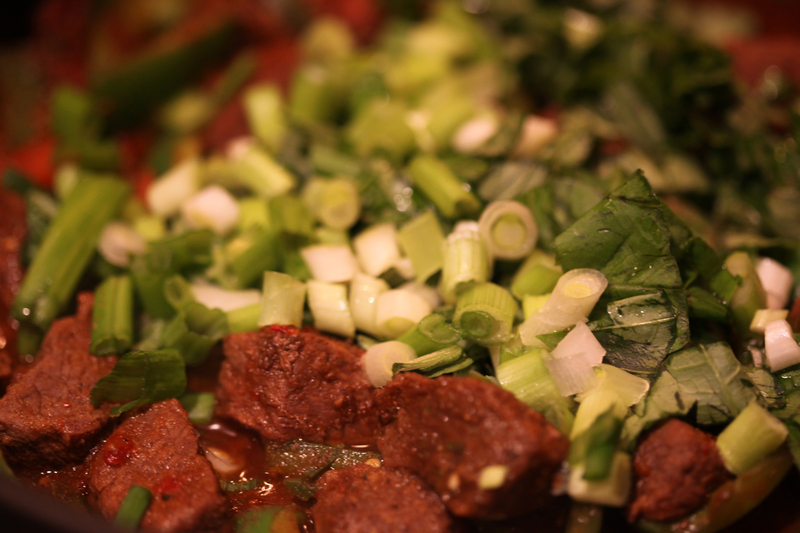 However, I was determined to make my own Kapow Beef and to ensure that every ingredient in it was healthy and organic. 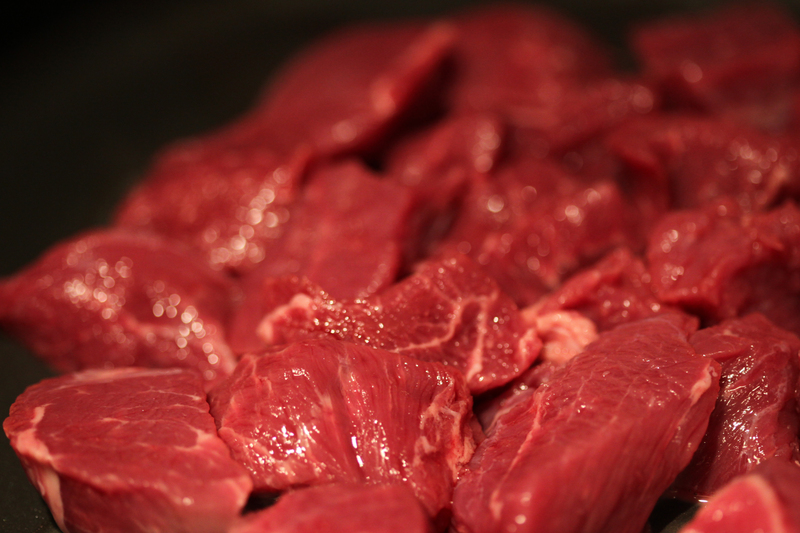 I started off with browning some cubed beef that would otherwise be good for stewing. I did not use any olive oil, instead just adding a touch of water to help the meat keep from sticking. I added the following spices which were added periodically to the vegetables I added also. I then added some chopped tomatoes and thinly sliced chili peppers. The tomatoes need the longest cooking time because I wanted them to soften and help to form the sauce. The chili peppers are some of the hottest I could find. Before you prepare this dish, read my warning at the bottom of this post. In addition to the hot chili peppers, this dish required some sliced green bell peppers also. 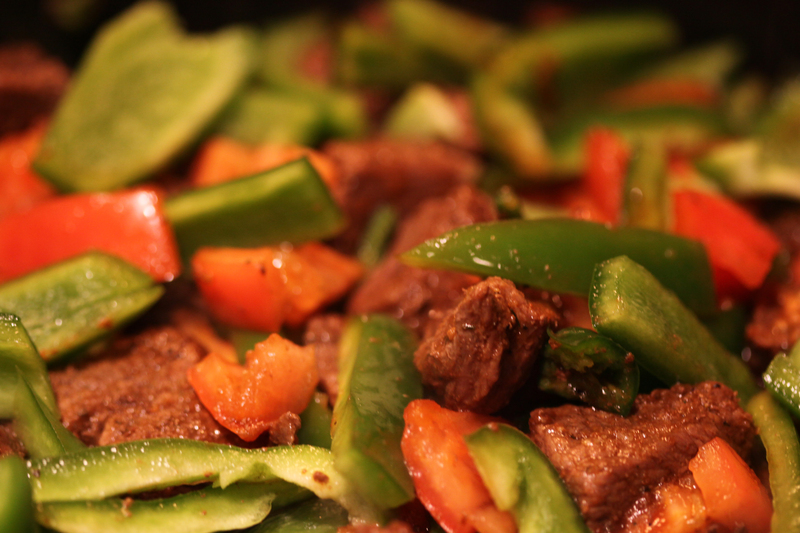 The bell peppers add a touch of sweetness to an otherwise spicy dish. On a green theme, I added some chopped green onions and fresh basil. As everything was cooking, I added a bit more seasoning as well as some soy sauce, teriyaki sauce, sesame oil, minced garlic, and chili garlic paste. These are the flavors that screamed Thai to me, more so than the Thai spice container I keep in my pantry. As all the flavors cooked through and the meat was done, my dish was ready in less than 30 minutes. With all humbleness thrown out the window, I have to tell you this is some of the best Kapow Beef I’ve ever had. A heaping pile of rice would have made it perfect, but this dish was so tasty that I enjoyed it without any accompaniments. For leftovers, I even tried it with a whole-wheat, whole-grain wrap as a sandwich. The dish was delicious, healthy, whole, and simple. To say I love Beef Kaprow is an understatement. I've been looking for a good recipe and yours sounds delicious, can't wait to try it this weekend. Thanks for posting!! ← Asparagus, Spinach, Tomato, and Hummus Wrap.